Can anyone give me detailed info on attaching a sabaton to the foot? I saw some pictures showing a strap going under the center of the foot but I don't understand how the sabaton was attached at the toe area. It can/should be pointed to the shoe. Exactly right. I'll attach a picture of my sabatons (made by Robert MacPherson). The attachment technique came directly from several effigies. The toe of the sabaton is pierced and pointed to the shoe. 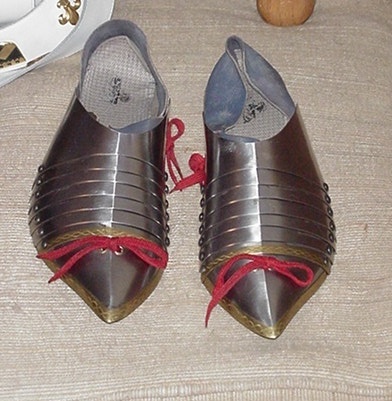 We also pointed it to a strap under the instep (you can see the points on the side of the shoe in the picture) because these are copies of the Charles VI sabatons which have no heel plate, but later we speculated that they could have been pointed directly to the side of the shoe instead. I also added a picture of the original so you can see the holes for the points. I don't have a picture of an effigy on my computer showing the points in place, but when you see them you see that they are tied in a sideways half bow like on mine. Exactly right. I'll attach a picture of my sabatons (made by Robert MacPherson). The attachment technique came directly from several effigies. The toe of the sabaton is pierced and pointed to the shoe. I'm sorry, I forgot to say that in this picture I mistakenly tied the points perpendicular to the axis of the foot when they should be tied parrallel to it. Later sabatons tend to get away from this arrangement. Often the tip either is rolled around like a cone with a flat side, or a flat piece is rivetted in. A piece of leather seems to have been rivetted on to the under side, to cut down on noise and damage to the floor.